In this blog, we are going through a run-down of all the backyard features that can make your backyard epic! Your children are only young for so long, it is best to make the most of it. 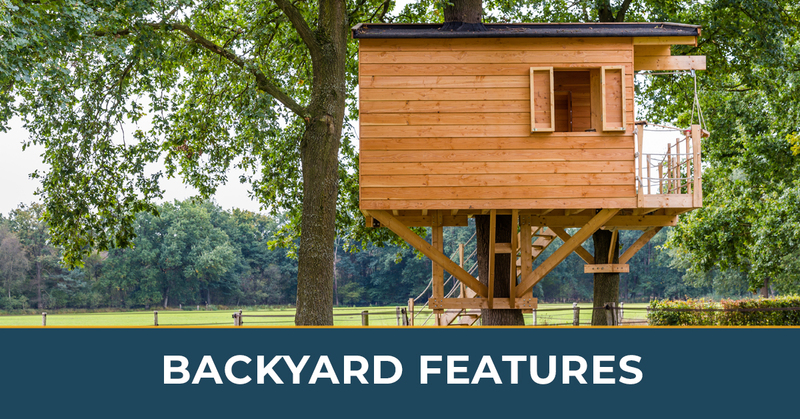 In this blog, we will go over the backyard features that your kids will love to play with. Make your backyard a childhood oasis! A playhouse is perfect for your little one. Outside they will be able to make all the mud pies they could ever dream of! Outside playhouses are an ideal place to teach your child about housekeeping, cooking, how to greet neighbors, and so much more. Playhouses teach your child the very basics of life! Not only are playhouses potentially educational, but they give your child a place to call their own and use their imagination. In a playhouse, your little one can be the greatest host or hostess! Treehouses are a lot like playhouses, but perfect for children a bit older. Best of all, treehouses can be useful no matter the age of your children. These incredible backyard features can enhance your backyard and give your child their privacy during playtime. In a treehouse, your kid can learn the benefits of being alone, as well as playing with friends. Mini golf courses are extremely fun and can teach your children the importance of concentration. Though golf courses can be a bit of a challenge if you don’t own a large backyard, there are other ways to still have a putt-putt golf course. It might take a bit of planning and architecture work, but once your golf course is resurrected, you can teach your child to love and enjoy the game of golf. Gardens are a great feature to add to your backyard because it has many potential uses. For one, gardens are beautiful and can add aesthetic value to your backyard. Aside from visual, gardens offer, however modest, a workout while you and your child attend to the plants. And lastly, gardens provide a unique opportunity to teach your children how to grow things and how magically nature can be. Lessons, such as these, can prove to be useful for your child, as they will learn where food comes from and how difficult it is to grow a good crop. Swing sets, no matter if they are apart of a playground or handmade with a tire and rope, can be fun and entertaining. With a swing set in your backyard, your children can soar high and enjoy the rush of air flowing past their ears. Swing sets can be a great addition to any backyard because they offer an endless stream of entertainment for all ages. Swimming pools are the ultimate feature to install in your backyard. Swimming pools can be used year-round and offer an optimal level of fun — no matter how old you are! Not only are they incredible to use for fun, but they also offer an incredible workout. Whether you are eight-years-old or 85, swimming pools can be used as a form of exercise. Only in a swimming pool are all of your muscles simultaneously. And, because of your body’s buoyancy, if you are old or injured, the water is easy on your joints. Aside from being used for physical workouts, swimming pools can offer educational lessons as well. For instance, your children and pets can utilize your pool to learn to swim or practice being a lifeguard. Learning to swim is one of the most important lessons anyone can learn, which makes owning a swimming pool that much more important. With a pool at your disposal, you and your family will likely learn how to swim very well as part of your recreation. At AmeriTex Pool Services, we are profound lovers of swimming pools. Any home’s value is increased by owning a swimming pool. And, with our help, we can help maintain, clean, and repair your pool when you need it. This way, you will be able to use your pool again and again, without worrying about algae or broken parts. If you are interested in swimming pool maintenance services in Houston, Texas, contact us today.